How do you feel when your favorite toy is broken? You want to get it fixed, right? In 1897, a neighborhood girl brought her broken doll to Mrs. Ella Gaunt Smith of Roanoke, Alabama, to see if she could fix it. Who would have guessed that this would help start a business? Mrs. Smith was a skilled seamstress and amateur photographer before she started making dolls. When she received the broken bisque (a type of porcelain) doll, she experimented for two years before she was able to repair it. She poured the head full of plaster, covered it with a scrap of stockinet (an elastic knitted fabric), and then repainted the features. She sewed the head onto the body and replaced the wig. From this, the Indestructible Ella Smith Doll was born. In 1901, Mrs. Smith received the first patent on her doll, and in 1904 she went to the St. Louis Exposition (World's Fair), where she won a blue ribbon for her dolls. In the early 1900s, her factory produced 10,000 dolls each year. 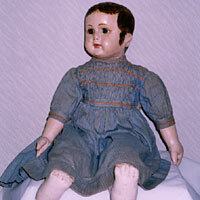 The dolls are known by several names: Alabama Baby, Alabama Indestructible Doll, Roanoke Doll, or Ella Smith Doll. Smith was the first doll maker in the South to manufacture black dolls -- 10 percent of her dolls were black. Nowadays, an original Ella Smith Doll is worth as much as $20,000.